I just love when new retail concepts open close to my office and I was so excited to see the new concept store OfficeMax Business Solutions Center, or the store of the future, open in my backyard! When companies are able to adapt and reinvent themselves, it is a win-win for us all. Both the company and the commercial real estate industry benefit. BTW, the location was formerly Argo Tea! Of course I had to interview the employees and ask them about this new venture. This is what I learned. There are 3 stores of its kind, Seattle, Milwaukee and Chicago, with a fourth store coming online in Evanston, Illinois. OfficeMax saw a need to serve the highly dense small business population in these locales. In this case 90,000 small businesses within a 1 mile radius! The store sizes currently range from 1,400 sf to 12,000 sf. The stores are outfitted with power stations to recharge your phone, wifi stations to work and print centers. I can tell you first hand it was a pleasure to walk into the store and be able to focus on only the products I need for business. Also, to have the staff to assist was great too. 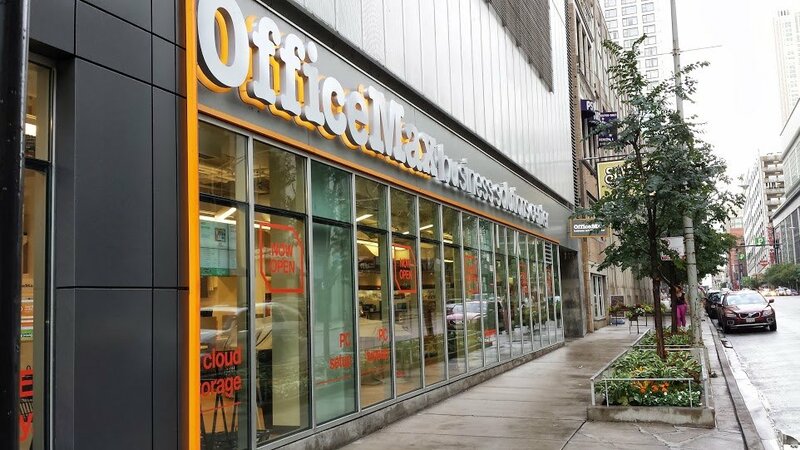 Great move on the part of OfficeMax since the office supply market is somewhat a dying industry due to less and less paper, and now they are evolving into this technology and small business resource. Smart, very smart. I hope this concept store is well received. I am very impressed with the focus on small business and the obvious gap OfficeMax wishes to fill. Thanks OfficeMax for coming to my community and I wish you much success.